[prMac.com] Bellevue, Washington - Eltima Software announces the release of the new download manager for Mac OS . 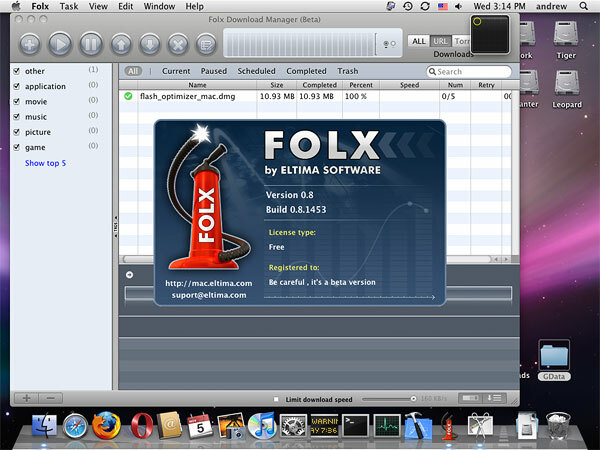 Folx is a free downloader for Mac OS, which increases the download speed by hundreds of times. Folx (currently in beta stage) is a free download manager for Mac OS. It downloads any file via HTTP, HTTPS, FTP directly or via proxy just in several clicks and at maximum speed possible no matter what browser is used. With Folx it's possible to download not only separate files, but the whole folders with all the contents via FTP. Eltima downloader for Mac increases download speed in hundreds of times by splitting downloads into multiple threads,so several parts of the file are downloaded simultaneously. Folx allows to download everything is needed but at the same time to limit the download speed. As a result the bandwidth will be saved for other more important tasks. Detailed download log provides with all the information about the progress, download errors, transmitted data, etc. With Folx Internet connection breaking during the downloading process is not a problem any more, because it continues downloading the file just where it broke off. One of the features of Eltima Mac downloader is the new folders organization system. It allows to add tags to every downloaded file. The same file can have several tags for the best data management.With Folx all the files can be searched even via Spotlight. With Eltima download manager anyone can schedule files downloading to achieve low traffic periods ((i.e. 5 in the morning) and organize the priority of the downloads. Eltima Software is a global software Development Company, specializing primarily in serial communication, mobile and flash software for Mac OS and Windows. "We've found the prMac distribution system and writing service to be by far the most superior way to communicate with the media. The professional grade of the returned press release and Ray's willingness to make it a success can't be beaten."